How many of you count calories before and after you eat something? Being a foodie I hate to admit it but , yes I do. Its not that i don't eat anything , high in calories , but I regret with a guilty cloud that I did. Any one there who does the same thing? I know , I am getting off lately than usual , and its just because I am pretty busy with stuffs in the personal front. Though I am trying my best to get me back on track , Mr Time doesn't seem to agree with me. More over now a days, I am not cooking any blog worthy mallu dishes too. After all ,this blog is my pastime favorite right! Have you heard of Vazhakka Uppu curry ? It used to be a kanji favorite back home , while growing up and some how lost its charm on the way , until last week when amma said she planned to make it , but ended up making this erissery/curry instead. When she said "Erisseryum , Unakkameen chammanthiyum , acharum ayirunnu innu curry; velliyazcha ayirunnondu erachi illayirunnu " (We had Rice with this curry,Dry fish chutney and pickle for lunch , and since it was Friday , no meat ") ; Catholics abstain from meat on Friday and I try my best to follow it at least till the evening....Ooh I couldn't just resist the urge to make exactly the same as soon as possible. Soak green gram for 2 hours . Cook it with enough water and salt and set aside. Combine all the ingredients in Bowl 2 in a cooking pan and cook covered until the plantain pieces are well cooked. Grind all the ingredients in Bowl 3 to a coarse paste. Add cooked green gram to the cooked plantain and bring to boil. Stir in the coconut paste and simmer for 4-5 minutes , until everything is blended together, stirring occasionally. Kothipidikum ketto...;)...Super platter...As always very beautiful clicks.. I think you were talking about me in the first few sentences :) :) Same pinch Sarah.. Not sure how time flies nowadays..
BTW I too love the vazhakkaya + cherupayar combination..
No worries we will still be here...sometimes life just gets in the way. Sarah this looks so good! I haven't used green plantains like this before. I must try it! I chanced upon your lovely blog many months back and was witnessing your evolution ever since. Vazhayila.com is the best kerala food blog with excellent pictures now in the web world . always like your clicks and looks delicious too.. I think I will like this, it is different with the plantain, a fruit I hardly ever use. Thank You for this - and your photos are really great. Curry looks awesome. Wonderfully prepared. I love the way you present authentic mallu food.. it just attracts any mallu! and yes i also count calories, even for a sip of juice!! It doesn't help in any way though! Loved the erissery and the droolworthy pics! truly mouth-watering! 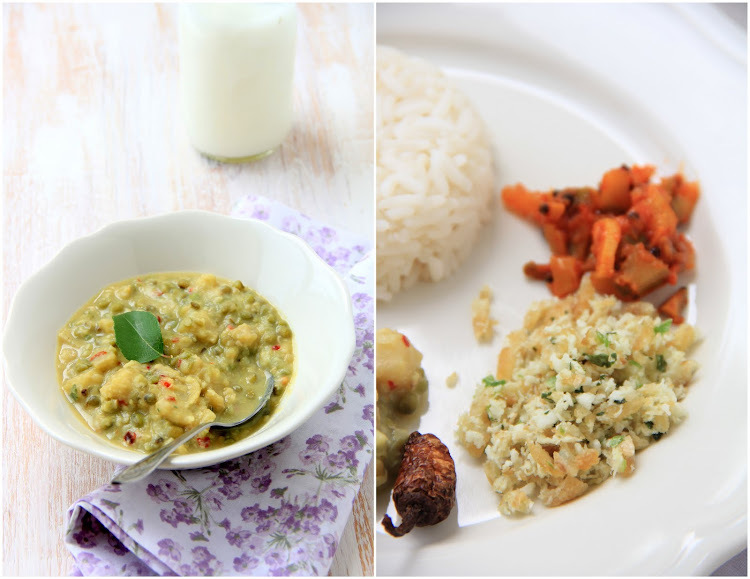 these are every mallu's fav dishes :) love the gentle colours in these pics! This is something very new to me..And so well laid out & presented!!! And yes...do count the calories after eating..But its I who usually try out new desserts or sweets & as a ;good chef' I let others have their share first...end up getting praises for dishes well done..to well sometimes actually..coz i get curses for the increasing tummy line!!! But meals like the one u have posted are a perfect solution..u get variety & taste!! So delicious and wonderful curry,seriously inviting.. Wonderful platter. Loved the low calorie dish !! A very beautiful and guilty free bean dish! Amazing clicks looks so tasty. WOW!! Mouth-watering clicks..Adipoli post, Sarah. I have never tasted this dish before, ennelum try cheyyam. Unnakkameen/chemmeen podichathu njangalde avideyum undkakrundu..Enikku kaduku manga achar kandittannu ettavum kothi varunnathu..Yum Yum!! I make thoran with cheru payar and vazhakka, but for erisseri I add vanpayar. This looks droolworthy. Amazing clicks. I loved the wooden background in your snaps. Is that a wooden table? Thanks for the recipe dear! I am feeling nostalgic after trying it. My husband also loved. Came across your blog today. Some of your recipes are new for me. Will surely try.